Those childhood hunger pangs, mixed in with a 5-year-old fussy eater, really became a fiasco for parents to deal with. One, of course, couldn’t leave a grumpy child hungry. What helps in such a situation then? The staple, of course! The most tantalizing Dal Makhni. 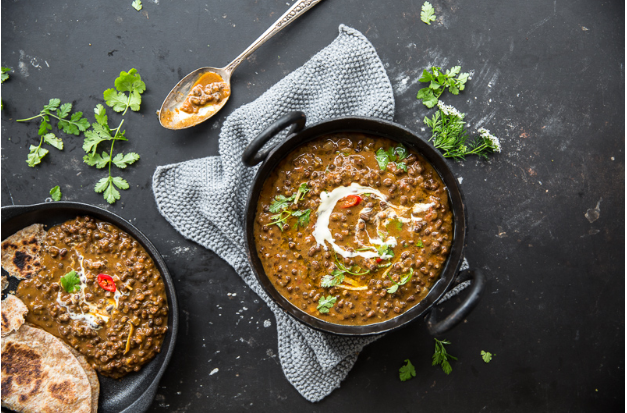 A bowl packed with the usual tomato and onion tadka, soft lentils of urad (black lentil) and rajma in a thick curry topped with cream and butter. Sounds like a perfect mix of childhood comfort, doesn’t it? Be sure to try this Indian food in Seminyak. Here’s an insight into the delicious past of this dal and here’s how we as an Indian restaurant in Bali Indonesia, cook it to perfection. A brainchild of Kundan Lal Gujral, founder of the Moti Mahal chain of restaurants, urad dal used to have a rather basic preparation. He added a twist to it and came up with the homely concoction called dal makhani. How’d he do that? Well, the first time he did something magical was with the butter chicken. Originally a dhaba (roadside restaurant) his chain used to serve chicken tikkas, however, whenever they did not use to sell, the chicken tikka would end up drying out and with no refrigerators to store them, they’d go to waste. Thus, he whipped up a delicious gravy containing a mix of tomatoes, butter, cream, and some spices. This essentially helped retain the chicken’s moisture and gave birth to the non-veg staple butter chicken. His work is surely an inspiration to us as an Indian restaurant in Seminyak. He used the same mentality with the urad dal. Added some tangy tomatoes to the basic recipe and topped it up with cream, butter, and some delicious spices. The tomatoes were added as a souring agent, that added a whole new flavor to do the dish. This was revolutionary because, no one had ever thought of adding tomatoes to a dal preparation and now almost every Indian dish requires a tomato preparation. Undoubtedly, offering Indian cuisine in Bali, meant for us that we had to have the household favorite on the menu. This delicious blend is something you can pair up with anything. As a restaurant that offers Indian food in Bali, we offer to serve it with rice, naan or rotis. Whatever suits a customer. Because the fact is that it works perfectly well with everything! The way we ensure the perfect Indian flavors in the curry is by giving it our undivided time and attention. For that, we cook it in a huge batch and let it simmer for 2-3 hours because we know it will sell. The more you let it simmer the better flavors it delivers. As the 1st, Original, Multi-Awarded, Most Established and Largest chain of restaurants offering Indian dining in Bali, we suggest anybody to begin the preparation a night before. You have to let the lentils soak in water overnight for them to go soft and offer easy cooking. Rest, all you need is cumin and asafetida, green chilies, ginger-garlic paste, and onions cooking in butter topped with spices. Add chopped tomatoes and cook it till it’s soft. Add the lentils, water and cook it till the mixture gets thick and lentils pulpy. 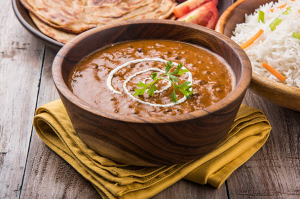 Top it up with the delicious serving of cream and butter and your delicious Dal Makhani is ready to be served and devoured. 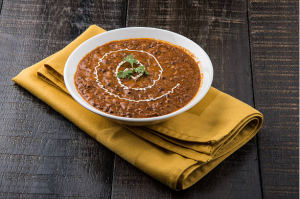 We’re sure you are heading to order the perfect dal makhani for yourself now. Well, give us a shot, as an Indian restaurant in Bali Indonesia we know a thing or two about doing it right!